THE VIOLA DA GAMBA SOCIETY 3RD COAST PRESENTS SPRING FLING 2019 The Viola da Gamba Society 3rd Coast will be presenting a sequel event to March Viols Madness 2018 with our Spring Fling 2019 – a venue for all members and their ensembles to perform a musical offering in a low-stress, supportive environment. Is it an open mic, musicale, salon, recital, dress rehearsal? Yes! Performers from beginner to professional are welcome to workshop a short piece or two among friends. From solo repertoire to consort music, from the Renaissance & Baroque to Contemporary music, hear performers spanning the breadth of the Great Lakes region including professional ensembles, soloists, amateurs & student groups. Free and open to viol players and their guests. 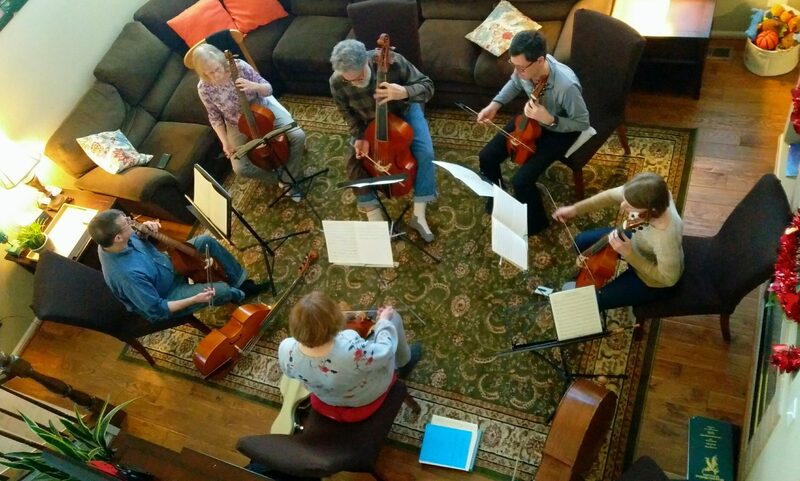 As part of Early Music America‘s Early Music Month 2018, the Viola da Gamba Society 3rd Coast will be providing a venue for all members and their ensembles to perform a musical offering in a low-stress, supportive environment. Is it an open mic, musicale, salon, recital, dress rehearsal? Yes! Performers from beginner to professional are welcome to workshop a short piece or two among friends. From solo repertoire to consort music, from the Renaissance & Baroque to Contemporary music, hear performers spanning the breadth of the Great Lakes region including professional ensembles, soloists, amateurs & student groups. Free and open to viol players and their guests. The Viola da Gamba Society 3rd Coast & Early Music America – building stronger communities through Early Music! The Spirit of Gambo – a Chicago Consort of Viols presented a mini-concert of intimate In Nomine settings for 1-3 viols including music by Martha Bishop (b.1937), David Goldstein (1918 – 2003), and Thomas Tomkins (1572 – 1656). The Third Coast Viols performed a rich and diverse program featuring music by Taverner, Tye, Tallis, Byrd, Picforth, Ferrabosco, Gibbons, Jenkins, Lawes & Purcell alongside contemporary works by Martha Bishop, and the premiere of the Fantasy á4 on “In Nomine” (2015) by Will Ayton. Thanks to the Viola da Gamba Society of America (VdGSA)‘s Consort Loan Program, Phillip Serna partnered with Naperville North High School orchestra director Dana Green to start a viol consort program in Chicago’s western suburbs. In an effort to engage the community, raise awareness about that work in schools, the Viola da Gamba Society 3rd Coast (VdGS Third Coast), New Comma Baroque‘s Phillip Serna, the Naperville North High School Department of Music, and Grounds for Hope Café at Trinity Lutheran Church presented a benefit concert to raise money to purchase viols showcasing viol players from across the Midwest – and indeed the country – in an ambitious marathon of Johannes Schenck’s complete ‘Nymphs of the Rhine’ – Le Nymphe di Rheno, Op.8 for 2 Bass Viols. For more information on viola da gamba activities in greater Chicago-land, please visit http://vdgs3rdcoast.org/. For a complete listing of concerts, visit either EarlyMusiChicago.org or EarlyMusicAmerica.org.